The 33rd Massachusetts Infantry monument is located at the intersection of Slocum and Wainwright Avenues near Steven’s Knoll. It was placed in 1885. I am diverging from the numerical order of regiments in large part because the 33rd Massachusetts will be one of the units portrayed at the upcoming Blue Gray Alliance 150th Gettysburg which my company of reenactors will be attending and I wanted to hone up a bit of their history. 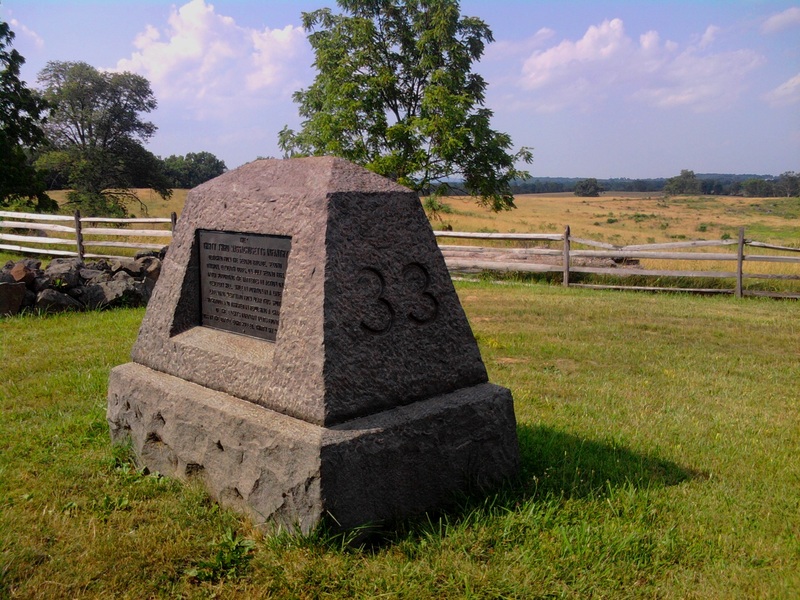 During the Battle of Gettysburg, the 33rd Massachusetts Infantry was part of the Second Brigade (Smith), Second Division (von Steinwher), of the XI Corps (Howard). The XI Corps is well known as having consisted mostly of regiments made up of German immigrants. The 33rd Massachusetts was the only Bay State regiment in the XI Corps and, being Massachusetts Yankees, did not resemble the typical XI Corps unit. The 33rd Massachusetts began to form in May 1862 and trained at Camp Stanton in Lynnfield, Massachusetts. They left the Bay State on August 14, 1862 and arrived at the capital on August 16, 1862. They soon marched to Alexandria, Virginia where they served guard duty during the Antietam Campaign. On October 10, 1862 they were assigned to the XI Corps. Being moved about quite a bit around Northern Virginia in November 1862, they were late in arriving at Fredericksburg and did not participate in that awful battle. The XI Corps gained an infamous reputation during the Battle of Chancellorsville on May 2, 1863 when Stonewall Jackson’s Confederates executed a devastating surprise flank attack. The XI Corps on the right flank of the Union line was caught completely unawares and caved pell-mell, resulting in a domino effect that all but sealed the Union defeat at that battle. Fortunately for the 33rd Massachusetts, their brigade had been temporarily detached to support the III Corps. They were not subjected to the flank attack on May 2 and rejoined their Corps the next day having taken relatively few casualties. Thus the 33rd Massachusetts entered the Gettysburg Campaign relatively untried in heavy combat. Still, their numbers had been considerably thinned by disease and minor battle casualties. They numbered about 550 men at Gettysburg. 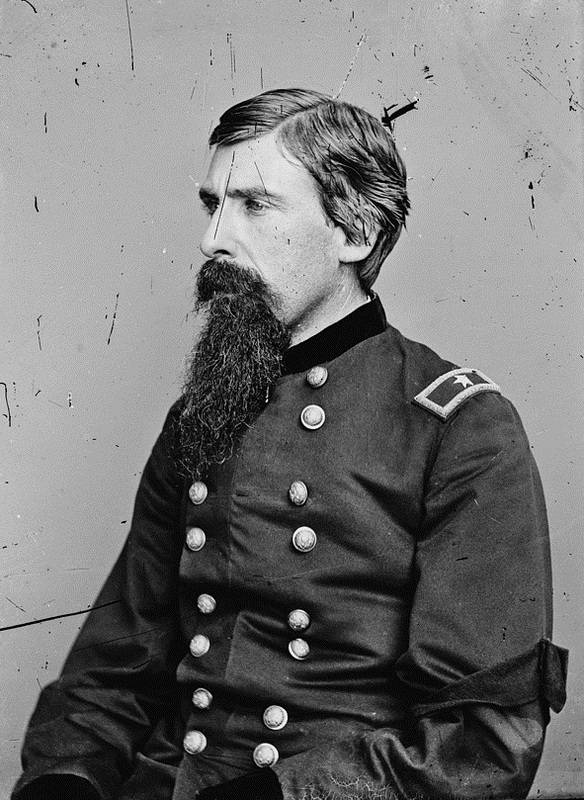 Col. Adin Ballou Underwood (1828-1888) commanded the 33rd Massachusetts at Gettysburg. This photo was taken after his promotion to Brigadier General in November 1863. Their commanding officer during Gettysburg was Colonel Adin Ballou Underwood. Born in Milford, Massachusetts in 1828, he was 35 years old during the battle. He was evidently named after Rev. Adin Ballou, minister of Milford’s Universalist society at the time of Underwood’s birth. A prominent theologian, Ballou would go on to found the utopian community at Hopedale, Massachusetts. Rev. Ballou stood for a number of reform movements including, ironically, pacifism. The XI Corps was one of the few elements of the Army of the Potomac to reach Gettysburg on the first day of battle, July 1, 1863. As the Confederate Army rapidly converged on Gettysburg from the north and west, the majority of the Union XI Corps was deployed north of Gettysburg in an attempt to stop the Confederate advance and hold the town. However, two brigades of the XI Corps (von Steinwehr’s division) were left behind on Cemetery Hill, south of town, as a reserve and to support the Federal artillery on that hill. This included the 33rd Massachusetts. Those who have studied this battle are familiar with the importance of this decision. If the Union Army could not hold back the Confederates west and north of Gettysburg, they would be forced to retreat through the town. They would need a rallying point, some piece of defensible ground where they make a second stand. Cemetery Hill was it. In his regimental history, Underwood claimed that General Oliver Howard, commanding the XI Corps, understood early on the importance of Cemetery Hill when he placed his reserve division there. The Federals, greatly outnumbered at that stage in the battle, were indeed forced back through Gettysburg…but only after a long and stubborn fight. The men of the XI Corps, who wanted so badly to redeem themselves after their humiliation at Chancellorsville, lost heavily casualties north of town and could not hold that line. One of von Steinwehr’s brigades was sent north as support, leaving the four regiments of Col. Orland Smith’s brigade (including the 33rd Massachusetts) as the sole remaining reserve on Cemetery Hill. Atop the hill, facing northwest, the men of the 33rd Massachusetts had a full view of the retreating forces coming back towards them. Underwood later wrote, “…the officers and men of the Thirty-Third looked down upon the winding lines, three miles long, and watched them as they stubbornly retreated, turning every few rods to fire a volley, facing in every direction…Our troops fought desperately in that retreat but it seemed like fighting the tides of the sea.” The shattered remains of the I and XI Corps reformed on Cemetery Hill and prepared to stop the Confederate advance. The 33rd Massachusetts was posted along the Taneytown Road behind a low stone wall, facing west, with the cemetery and the batteries behind them. Confederates were advancing, forming up in an orchard in their front. A staff officer conveyed the order to Underwood that the 33rd Massachusetts was to hold their fire until the Confederates advanced into very close range. Underwood said he would obey but knew, “it was not an easy thing to keep men cool in the the fiery impatience that comes in battle, especially when everything seemed to be giving away.” But the Confederates did not advance in force at that time. There was some skirmishing, but the first day’s fighting was essentially at a close. In the morning of July 2, the 33rd Massachusetts was detached to serve with Gen. Adelbert Ames’s brigade of the XI Corps. They moved to the east side of Cemetery Hill, forming behind another stone wall on the Baltimore Turnpike, just in front of the landmark brick gate of the cemetery. The fierce artillery barrage aimed upon Cemetery Hill soon began. Underwood recalled the chaos as debris filled the air, “splinters of gun carriages, pieces of tombstones, even human legs and arms and palpitating flesh were flying about in every direction.” The shells seemed to hit the 33rd Massachusetts from all sides, such that Underwood actually moved his men from one side of the stone wall to the other several times. That afternoon, the 33rd Massachusetts was moved farther to the right, into the meadow between Cemetery and Culp’s Hills. There was a prolonged and powerful Confederate assault on Culp’s Hill off to their right late in the second day and into the night. On the 33rd Massachusetts’s part of their field, two Confederate brigades Early’s division attacked Cemetery Hill at about 8 pm. The 33rd Massachusetts fell back to the base of Cemetery Hill on the right of the 41st New York, behind yet another stone wall (about the position where their monument stands), and peered through the twilight as the dark lines came steadily towards them. Union artillery opened up but still the Confederates came on. Underwood predicted it would come to a push and ordered the men to fix bayonets. The 33rd Massachusetts opened fire on the 57th North Carolina in their front, slowing them, but the Confederates were soon just a few feet away from their stone wall. And then Stevens’s 5th Maine Battery on their right, which had been holding their fire for the key moment, opened up simultaneously with a six gun, double-shotted volley of canister. The North Carolinians seemed to simply disappear. Farther to the left, the brigade known as the Louisiana Tigers did break through and threatened not only the Union guns on Cemetery Hill but also began to pour fire into the backs of the 33rd Massachusetts. Underwood sent his adjutant to the rear to inquire why the regiments on the hill were firing into their own men. The adjutant brought back the answer, “It is the rebels.” It seemed desperate for a moment, but the Tigers were soon surrounded by brigades of the II and XI Corps. In the night after the second day of fighting, the 33rd Massachusetts was moved again to the right between Cemetery and Culp’s Hills, forming on the left of Stevens’s Battery. They were in that position in the afternoon of July 3 when the Confederate cannonade, preceding Pickett’s Charge, opened up. Underwood recalled it was, “the most awful cannonade probably that has ever taken place in this world.” The men could do nothing but hunker down. Being on the east side of Cemetery Hill, the 33rd Massachusetts played no role in repelling Pickett’s Charge. That night, the men tried to make a meager supper out of the wheat in the field around them. Then they were sent back to their brigade along the Taneytown Road and exchanged fire with Confederate skirmishers on July 4 as Lee’s army prepared to retreat. In the battle, the 33rd Massachusetts had lost 8 killed and 38 wounded (about 8% casualties). This entry was posted on Saturday, May 11th, 2013 at 2:45 pm	and tagged with 33rd Massachusetts Infantry, Adin Ballou Underwood, American Civil War, American History, Battle of Gettysburg, Cemetery Hill, Gettysburg, History, XI Corps and posted in American Civil War. You can follow any responses to this entry through the RSS 2.0 feed. Is there any way to find the names of the 8 killed in the 33rd Mass Infantry on July 2, 1863 at Gettysburg? Thank you, so much. This confirms the family history repeated through the generations that one of those killed at Gettysburg on this date was Zara Coston Howe. With a man named Howe being among those killed, I feel I now have confirmation of this family fact. Do you know where the four not buried under the monument to the 33rd are buried? I did look for military records of a Zara C. Howe and could not find one. Not sure if this helps or just throws things into confusion. Oh, my — it appears I must continue my search. I was so excited to think I had finally found Zara Howe. He is listed on Ancestry.com as being killed on July 2, 1863 at Gettysburg while fighting with the 33rd Mass Inf. Thank you for the information you have provided, even if it wasn’t what I wanted to hear. — Many thanks! I’m in Gettysburg right now. At the National Cemetery are the graves of E. Howe, Co. H, and Calvin Howe, Co. I. I was trying to figure out if they were brothers. We visited the Memorial recently. May ancestor George Edwin Clark was 18 years old and a musician in the Massachusetts 33rd. Thank you for this recounting of the events.